Periodontal disease is an infection of the gums caused by bacterial plaque, which is a sticky film that collects along the gum line. If plaque is left on the gums for a long time due to a lack of proper dental hygiene, it can lead to inflammation. This may cause the gums to recede from the teeth, creating spaces known as periodontal pockets. These pockets often become the breeding ground for bacteria, and if the infection is not treated in time, it could spread to the bone, causing decay and tooth loss. Scaling and root planing is a deep cleaning method used for non-surgical treatment of periodontal disease. The goal of this treatment is to rid the gums and teeth of harmful bacteria and the toxins produced by them. Scaling is used to remove plaque and tartar from the teeth as well as above and below the gum line. Root planing is then used to smooth out the root surfaces so that bacteria cannot adhere to them easily. We may also give you an antibiotic treatment to remove any remaining bacteria. Scaling and root planing can halt the progression of periodontal disease and protect the teeth from further attack by the infection. 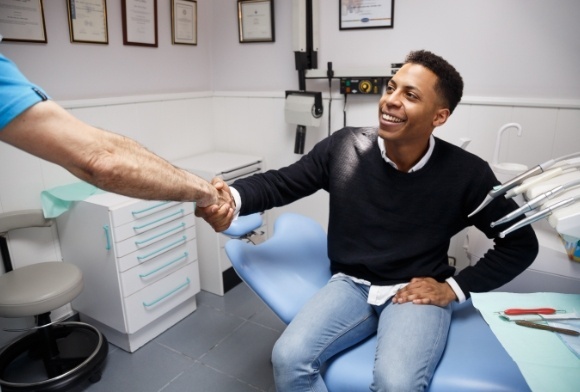 After a deep cleaning, a patient should practice proper oral hygiene and get their teeth examined regularly at our office in order to make sure that gum disease does not resurface. If you are suffering from periodontal disease, seek immediate treatment and quality care at here at Celebration Family Dental. Contact us today for an appointment.